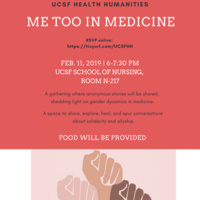 The purpose of this event is to bring together UCSF health professionals to share anonymous stories related to the theme of gender disparities for the purpose of strengthening community. Topics can range from subtle gender dynamics to sexual harassment, and everything in between, including stories of solidarity and allyship. We are specifically looking for stories related to training and working in health care, e.g. experiences that occurred in the classroom, on campus, between colleagues, during clinical encounters, or elsewhere. We welcome stories from all genders. Selected stories will be read aloud by trained volunteers. We are seeking stories for our upcoming event and welcome all respectful listeners and allies. Please click here to submit your story by February 2nd, 2019. In consideration of the sensitivity of these stories, please review our guidelines before submitting. We are grateful for your participation and courage. Your stories will help to increase awareness of how gender disparities affect our UCSF community. We hope storytellers will find comfort in the space and audience for processing, healing, and solidarity.